Hello, this is Yolie with the Cut N Boss team. We continue our 2nd week featuring our sponsor Latina Crafter. I've been creating 5"x5" square cards lately and I like it. On today's square card, I used Latina Crafter's "hola" die, DCWV Classy Copper paper and Craftwell Cabbage Rose embossing folder. 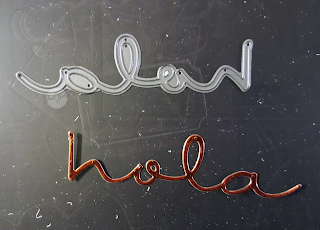 I embossed the green pattern paper and cut the "hola" die from the foil copper paper. 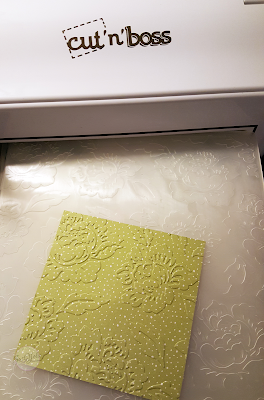 I fussy cut the top accent floral print from a 4" x 6" cut-out sheet included in the paper stack. Adhered the "hola" and the "thinking of you" strip. I used Glue Dots for added dimension and attached a tiny scallop ribbon to the bottom and seam binding ribbon on the top. It's difficult to see, but the foil copper accents are beautiful.